Both boats were launched due to a strong wind and rough seas, to a male who had called the coastguard, to say he was cut off by the tide between Rhyl and Prestatyn. The local coastguard team was also called out to search the shore. After arriving on scene and searching for about 10 minutes, the coastguards discovered the man walking near the sea path, having managed to wade ashore. As the man was wet and cold but unharmed, all units were stood down, the lifeboats arriving at the boathouse at 2010. Rhyl AWB was requested to launch to a 24-metre vessel guarding the area of the Gwynt-Y-Mor windfarm under construction. The vessel had engine failure and required assistance. The lifeboat crew took an hour to get to the vessel 11.5 miles out from Rhyl, having to keep clear of the construction vessels, and a tow was set up towards Liverpool and out of the windfarm area. The tow was carried out towards the Liverpool bar buoy at the River Mersey entrance, where Hoylake lifeboat took over, being in their area at the entrance. Rhyl lifeboat followed them in and provided a line to the stern of the vessel to act as a brake in the fast-flowing Mersey. The vessel was taken in to Langton Lock where another docks vessel took over. Both Rhyl and Hoylake lifeboats returned to station, Rhyl being back on station for 21.30. North Wales police contacted Holyhead Coastguard regarding a distressed female going into the sea between Rhyl and Prestatyn. Due to the heavy rain and squalls, the AWB was requested. On launching, the crew started searching the near the shore from the Rhyl end of the search area, with Rhyl coastguards searching on shore. After about 15 minutes, the police notified Holyhead coastguard that the casualty had been found safe ashore, and had not gone near the sea front. All units were stood down, the AWB being ready for service at 0500. The AWB crew had just completed a 3-hour exercise at 1510, when Holyhead Coastguard requested they re-launch, to evacuate a crew member from one of the larger vessels working on the Gwynt-Y-Mor windfarm. Rhyl crew were just leaving a civic function to celebrate the lifeboat chaplain’s 40 years as a priest, when the pagers went off. 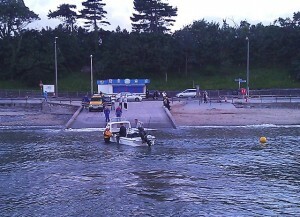 A 21-foot fishing boat had broken down on passage to Rhyl off Colwyn Bay pier. A tow was undertaken to Rhyl harbour where the casualty was left on the pontoon with Rhyl coastguards. The lifeboat returned to station at 17.30. The AWB was launched to assist with the transfer of a sick crewman on one of the large vessels lying off the coast, involved with the construction of the Gwynt-Y-Mor windfarm. The man had complained of being unwell over a long period, and he was taken ashore to be met by an ambulance crew, who took him to hospital. The lifeboat was back on station by 0630. Prestatyn Sailing Club relayed a “Pan Pan (Urgency)” signal to Holyhead that a small rigid-inflatable about 2 miles from their location had engine failure with 4 persons on board. The AWB was launched and found the craft waterlogged and with sea water over the batteries, a potentially dangerous situation. The 4 people were taken on board, and crew members went on board to bale out the boat and make the batteries safe. The vessel was then taken under tow back to its launch point in Prestatyn, and the Sailing Club were thanked for their assistance in preventing what could have become a serious incident. All the 4 persons were slightly cold and wet, but no medical attention was required. The lifeboat returned to station at 1430. The crew were preparing for a photo shoot and practice launch when Holyhead coastguard received another radio message from a dayboat to the South-East of the Rhyl Flats windfarm, stating they had engine failure. The boat was launched within 10 minutes and found the vessel with the direction-finding equipment on board, homing in to the radio signal. the 2 males were taken on board and returned to their launch point near Colwyn Bay pier. No medical attention was required, so the boat and crew were handed over to local coastguard volunteers. the lifeboat returned to station at 2130. Both boats requested to launch to Talacre to assist police and local coastguards recover a man who had gone swimming near Talacre lighthouse. As the crew were assembling, Holyhead coastguard reported the man had come ashore and was in police custody, so the sea-based units were stood down. Classed as a standby. Both boats were launched after Holyhead coastguard received a 999 call saying a male swimmer off Prestatyn’s Barkby beach had disappeared from view whilst swimming between the rock groynes. The local coastguard team, police, and the police helicopter were also tasked. The boats searched offshore for over 90 minutes whilst coastguard teams scoured the shoreline. A member of the coastguards was then informed that a male had been swimming in a wetsuit in the area, had dived under water, and then come ashore some distance further on. The coastguards were shown where the man was staying and he confirmed that the swimmer had been him. As all was well, all units were stood down, and the lifeboats were back on station for 2300. Both boats were launched after Holyhead Coastguard received a call from a person stating they had seen an adult entering the water, fully clothed, between the Nova Centre Prestatyn, and Splash Point, Rhyl. The ILB started to search close to the sea wall (it was high water) and the AWB searched up to 1/2 mile off between the 2 points. The first informant was known to both the police on scene and the coastguards, as having previously made calls to the emergency services. There was, therefore, some query regarding the information given. The North Wales police helicopter was on another job, and so the Merseyside helicopter was utilised to conduct an infra-red search of the shoreline. After about 90 minutes of searching, all units were told to do one final sweep of the beach, as the tide had receded sufficiently for the sand to start showing. As the ILB crew were about 1/2 mile East of Splash Point, they saw the figure of a woman lying prone on the beach. The crew immediately made for the spot, and the AWB backed up to provide 2 extra crew on the remote part of the beach. The woman had cuts to her face and hands, and was wet up to her waist. She was given first aid by the crew, who made her safe until coastguards and police and ambulance persons arrived on scene. The woman was taken to hospital. It is not known whether the initial call and the subsequent service were actually the same incident. All units then conducted a further shoreline search to see if there was anyone else on the beach. No-one else was seen, and so the boats returned to station by 0400. The crew were assembling for a crew meeting when one of the leisure fishing boats from Rhyl reported to Holyhead coastguard that they had found a small dinghy with some work boots in it, 6 miles off Rhyl. The coxswain overheard the message, and contacted the coastguard, who asked for the crew to assemble in case the AWB was needed. The fishing vessel skipper had a conversation with the coastguard, and volunteered to tow the dinghy in to Rhyl. the AWB was stood down and this was classed as a standby at 1835. A “Mayday relay” message was received by Holyhead Coastguard, that a small dayboat with 2 people on board were having engine starting problems. and were stuck on a sandbank about 1 mile off Talacre lighthouse. The crew were already at the boathouse for the annual Rhyl Air show, and the boat was launched within 5 minutes. As the lifeboat was underway, the message came through that the boat’s engine had now started, but the crew requested the lifeboat proceed to stand by. The lifeboat met up with the craft about 1 mile east of Barkby beach Prestatyn, and escorted the dayboat back to it’s launch point. Once the boat was safe ashore, the lifeboat returned to Rhyl to take part in the Air Show displays, arriving back on station at 1207. The ILB crew ere paged after a fisherman on Kinmel Bay beach saw a dog enter the water and refuse to come back. The owners, 2 young girls, were frantic on the shore and were threatening to go in the water after the dog. However, the ILB developed an engine fault, and so the AWB was launched. Arriving on scene some 6 minutes later, the crew searched the inshore area between Kinmel Bay and Sandy Cove, but saw nothing in the water. Contacting the public on the shoreline, the crew were told that the 2 girls had succeeded in retrieving the dog, and had left the area. The AWB returned to station as nothing else was sighted, being back on station for 1406. As the ILB was called on service to Talacre (See ILB page) , numerous reports of persons trapped on sandbanks by the incoming tide, were reported to Holyhead coastguard. It was decide to launch the AWB and use the inflatable X-boat to assist the persons (including 2 babies in pushchairs) back to shore safely. 2 crew were already wearing drysuits on board, so they took the X-boat from the sea to the banks, then took 9 people off the sandbanks to safety before returning to the AWB. As the weather was very hot, with incoming tide and offshore breeze, the AWB remained at sea until the ILB was released from it’s job at Talacre to return to Rhyl. This was the start of a total of 10 callouts in 1 day for Rhyl’s crews. As the ILB was returning from service, Holyhead Coastguard received a report of 2 men overdue from a trip to the Rhyl Flats windfarm. It was not confirmed that these 2 were the same as the incident the ILB was dealing with, and so the AWB was requested to launch. As the ILB brought the original 2 men back to shore, it was confirmed by the informant that these were the 2 men reported overdue, but the local coastguard teams reported the names didn’t match. However, the informant said these were the 2 men, and they had given different names to the coastguards. The AWB was therefore stood down before launching, classed as a standby. Both boats were launched to assist in the rescue of a woman in distress on Kinmel Bay beach, at the entrance to Rhyl’s harbour, on an area known as Horton’s Nose. The local coastguard volunteer team were also called to assist police recover the woman, who was face down in the water, about 20 metres out from the shore. The coastguard team had arrived just before, together with police officers; and the lifeboat crew assisted in calming the woman and administering oxygen. The woman appeared to be hypothermic, and the best course of action was to take her on board the inshore lifeboat, and transfer her into the harbour to waiting paramedics. The all-weather lifeboat was also on scene, and escorted the inshore boat in to the harbour. The RNLI crew of both boats then helped coastguards, police and ambulance personnel get the woman into an ambulance and she was taken under police charge to Glan Clwyd hospital. This was the first time the RNLI crews had worn the new lifejackets supplied by donations to the Rhyl station over the last 3 months. Both boats were launched after an 18′ foot cabin cruiser with 4 persons on board, reported their engine had failed off Kinmel Bay. As the crew were assembling, it could be seen that the boat was being blown to the shore, and so the ILB was launched first, backed up by the ALB. The ILB took the boat in tow until they were far enough offshore for the ALB to close. As there were so many on board the casualty, the offer of transferring to the ALB was given, to lighten the load when entering Rhyl harbour, due to the swift waters there during the harbour reconstruction. The offer was declined, and so the ILB towed the boat alongside, with the ALB following up. Due to the current, the ILB was only making about 4 knots, but managed to get the casualty on to moorings in the harbour, and then both boats returned to station by 1550. The crew were at the station for their monthly meeting when word came through that the 2000-tonne coaster “Carrier” had gone aground near Raynes Jetty, and the boat was being battered against the rocks in a north-easterly gale and 5m breaking waves, with 8 crew on board. The crew immediately got ready, launching the boat and being on scene in 25 minutes. Llandudno lifeboat was also launched to assist. Numerous Coastguard units were tasked to help, and also police, fire and ambulance units were mobilised. On scene, the breaking seas meant the lifeboats could not get less than 150m away from the vessel, which was broadside on to the rocks at Llanddulas. The RAF helicopter was unavailable at the time, so a Royal Navy rescue helicopter was tasked but had to refuel at RAF Valley first, and so the lifeboats and multiple rescue services on land stood by until the helicopter arrived. 6 crew were winched off the coaster, but a tangled winch wire meant the helicopter winchman and 2 remaining crew were left on board. These were picked up by a separate helicopter tasked from Ireland about an hour later. The 2 lifeboats had taken quite a beating in the large confused sea and were stood down at about 2320, as the tide was ebbing, and the boat was settling on the beach. Rhyl lifeboat returned to station at 2345 and Llandudno’s boat some 15 minutes later. These seas were perhaps the most confused and rough seas the crew had encountered for many years, and the coxswains of the 2 boats did a great job holding the boats in position for nearly 3 hours. The incident attracted great media attention (see links). The vessel had been holed on the starboard side and during the following few days, the diesel was pumped from it’s tanks, with only minimal pollution, which would be dispersed naturally, according to experts on scene.